Global companies and business leaders agree that the Human Resources function needs to be transformed. 85% of those companies believe that the transformation of HR is fundamental to effectively address business and employee increasingly complex demands in the uncertain and chaotic environment we are living in. The 2015 Human Capital Trends report by Deloitte shows that 64% of business leaders believe that HR is delivering only average to low performance, whereas 31% think HR is just doing a “good” job (only 2% thinks HR is doing “excellent”). In addition to that, only 30% of the leaders believe that HR provides sound business decisions. What these numbers show is the strong disconnection between what the business and employees expect from HR and what HR is actually doing and delivering. HR people are still mostly focused on compliance and administrative activities. However, the pressure on HR to create and add more strategic value continues to increase. Today, HR is more of a roadblock for many businesses rather than a springboard on which people can unleash their talents and the business meet its goals. Most of those old systems thinkers think that HR is still all about compliance and that it doesn’t need to change. But the analog HR that they embody is not delivering the type of strategic value and results that businesses need. The analog HR that served a purpose 20-50 years ago is not relevant anymore. It lost its value. The transformation of HR from an analog unit to the Digital HR is becoming more urgent than ever. It’s the only way for HR to truly contribute to the workplace meeting its current and future demands. The upgrade from analog HR to digital HR can’t be postponed anymore. It’s important to mention that the transformation of the HR function is not only about technology. Instead, it requires a comprehensive and strong new value proposition or NVP. The NVP revolves around four elements that I call the Quadrants of The Digital HR. Maximizing Employee Experience is in Quadrant 1 because it’s the foundation of an attractive workplace. 80% of business leader recognize that employee experience is important, but only 22% of them think that their companies are delivering that employee experience. The cornerstone of HR’s NVP is achieving maximum employee experience (MEE). There are many elements to operationalize the achievement of MEE. They include the alignment of business purpose with people’s quest for meaning and happiness; a culture of support and challenge; flexible and strategic opportunities for career development and professional growth; new organizational structures that accommodate more collaboration, teamwork and innovation; recognition of goof performance (a new performance management approach) and a new type of leadership based on more relevant skills. The business is claiming for HR to be more strategic and add more value. They not only want HR to understand what the business outcomes are, but also to fully align its strategies and the way people operate to achieve them. Unfortunately, the business’s demand is not reaching HR. It’s not surprising that to respond to this disconnection, 40% of Chief Human Resources Officers are coming from the business and not from HR. HR’s NVP starts with people and continues with rethinking its approach to adding strategic value by aligning and connecting the HR function and the way people operate with business outcomes. For this to be possible, the first responsibility of HR is to truly understand how the business works and what the outcomes are. It seems obvious, but most business leaders don’t think that HR really understands what the business is about. HR must provide a framework that addresses the organizational, corporate and talent challenges to achieve the outcomes. HR is not only disconnected from the business, but the way it operates is heavy and rigid. Perhaps this approach worked in the times when the specific function of HR was to ensure that workers were following instructions from top management. But the world is different today. Agility means the capacity to rapidly and successfully respond to uncertain, volatile and changing business and people’s demands and conditions. We live in a chaotic world that is only going to become more complex and more chaotic. HR can’t really think that heavy policies and processes will yield any positive result in such a world. HR needs more flexibility. In combination with Quadrant 1: People, Quadrant 2: Becoming More Agile is all about the transformations of strict systems, policies and rules into more general and flexible guidelines and frameworks that establish the operational approach to people operations without constraining employees to the point of killing their engagement and creativity. In HR, agility is tantamount to creating “structures” that serve their purpose today, but are flexible enough to be changed tomorrow to respond to new demands (among them, performance management and total rewards). For example, most business leaders recognize that talent acquisition and retention is their number one corporate priority and concern. This concern shows one of the potential areas where HR can fully demonstrate its agility skills and reframe the old practices of hiring and retaining top talent. 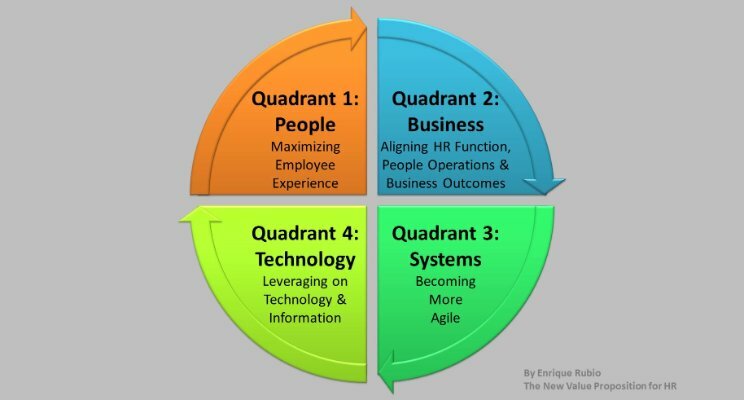 This involves the type of tools HR is using (integrating with Quadrant 4: Technology), the type of incentives and job design offered to potential candidates (Quadrant 1: People) and communicating a strong organizational purpose (Quadrant 3: Business) to attract the best talent. I purposefully left technology for the last quadrant. The digital transformation of HR is critical and only 9% of all companies are ready for the era of digital HR. But I left technology for the last quadrant not because it’s not important, but because I needed to change the narrative about the digitization of the workplace and HR. Increasing the understanding of technology, its impacts and applications in the workplace and people operations. This doesn’t necessarily mean that HR people need to be experts in artificial intelligence or machine learning, but they have the capacity to know how to use those technologies to add more strategic value. Building multi-dimensional teams. This means that HR departments need to bring onboard not only HR people with HR experience, but professionals from other knowledge fields, including people from the business. Evolving from compliance and administrative assistant functions to a more comprehensive range of skillset needed for the digital HR, including: critical thinking, curiosity, imagination, experimentation, decision-making, agility and collaboration. Understanding data. Perhaps the one technical skill in which all HR people will need to become fully proficient is data analytics. HR people won’t necessarily be the ones mining the data or creating the technological systems that do it. But they will be the ones using that data and transforming it in business inputs to drive more effective decision-making. Reference: Enrique Rubio, CSM, CSPO from LinkedIn.